Angela Merkel’s government is on the brink as the German chancellor battles her coalition partners on immigration and asylum seekers. The coalition between Merkel’s Christian Democrats (CDU) and the Bavarian Christian Social Union (CSU) has fractured over the latter’s new proposed policy that would turn away more asylum seekers at the country’s borders. The policy flies in the face of the most powerful woman in the world and de factor leader of the European Union. In 2015, her 'open door' policy to migrants saw approximately a million refugees flood into the country. Although migrant arrivals have dropped steeply in the past two years, Germany still registered around 11,000 new asylum-seekers each month. Her decision is believed to be a major contributing factor to the surge in support for the far-Right and anti-Islam Alternative for Germany (AfD), which became the third-largest party in Germany after the 2017 federal election when it won 94 seats in the Bundestag. Horst Seehofer, the CSU interior minister, whose party is facing regional elections in October, wants Germany to turn back refugees who have already registered in other European countries. He also wants to block migrants whose asylum applications in Germany have already been rejected from returning. Merkel fears such a move could increase the burden on countries include Italy, Greece and Spain, believing it could potentially fracture the European Union even further. While she wants to see a bilateral agreement at a EU summit and the end of June, the CSU has set her an effective ultimatum of next Monday. “Personally, I think that illegal migration is one of the challenges for the European Union and therefore I believe that we shouldn’t act unilaterally, that we shouldn’t act without coordination and that we shouldn’t act in a way that burdens third parties, involved,” Merkel said. Wolfgang Schaueble, the former finance minister and current parliamentary president who is respected on both sides, has been asked to mediate negotiations between the CDU and CSU. “We are in a serious, a very serious situation,” said Alexander Dobrindt, the CSU parliamentary group leader. A poll published on Thursday by German broadcaster ARD found that 62 per cent of its citizens believe refugees without papers should not be allowed in. The CSU fears that anti-immigration sentiment in the country could bring an end to its decades-old stranglehold on Bavaria’s government. They face crucial regional elections in October. The coalition’s center-left ally, the Social Democrat Party (SPD), has demanded that the dispute be settled. 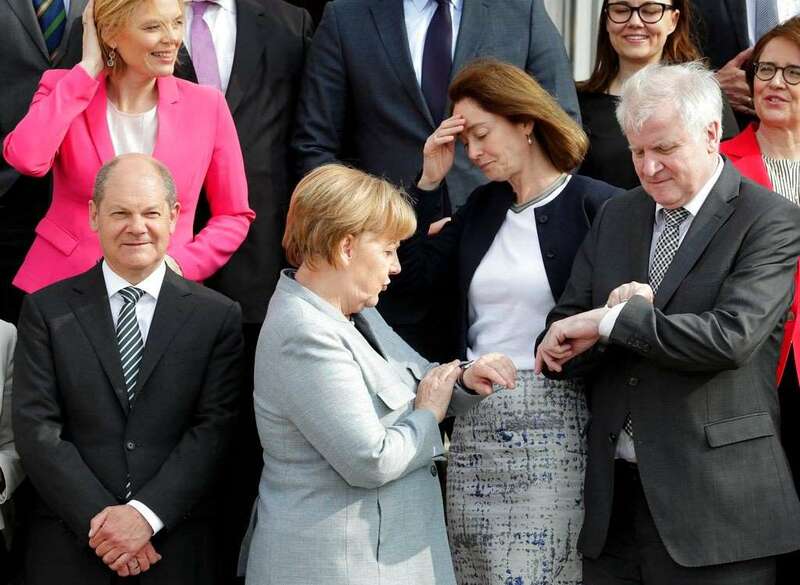 Andrea Nahles, the leader of the SDP, accused Markus Soeder, the governor of Bavaria, and Seehofer of “taking all of Germany and Europe hostage”. She added that Soeder was acting like a “bonsai Trump”. Adding to tensions, a Twitter hoax made Germans think the government had already collapsed. An account claiming to be Hessicher Rundfunk state broadcaster claimed Seehofer had dissolved the alliance, but minutes later it was confirmed to be fake. Germany has seen more than one million asylum seekers arrive since 2015 since Merkel introduced her open door policy, but she has even acknowledged the need to strengthen the EU’s external borders. Both Austria and Italy have seen anti-immigrant parties come to power since 2015. On Wednesday, during a meeting with Seehofer, Austrian Chancellor Sebastian Kurz voices his approval of Seehofer’s ideas. “In our view, we need an ‘axis of the willing’ in the fighter against illegal migration,” Kurz said. Merkel has served as chancellor of Germany since 2005 and has come top of Forbes list of the 100 most powerful women in the world for 11 of the past 12 years.